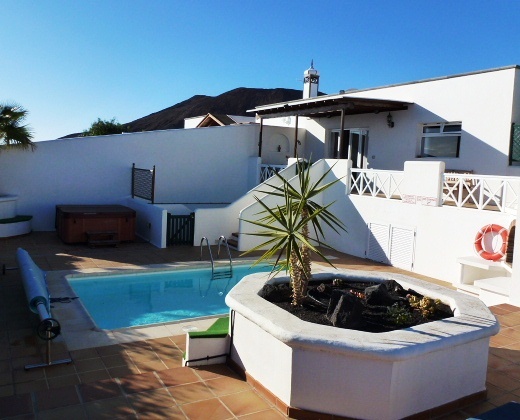 This lovely holiday villa sleeps six and comes with its own private heated pool, Jacuzzi hot tub and air conditioning. 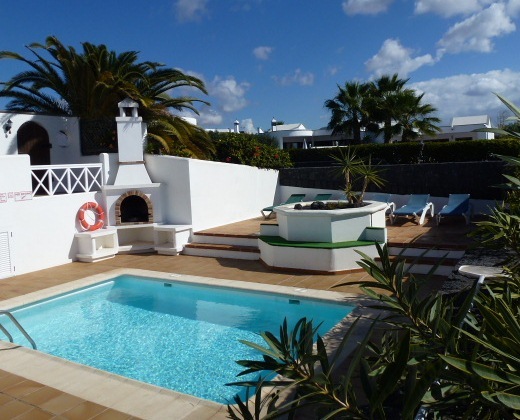 Located in a quiet and peaceful residential cul-de-sac in Playa Blanca, this deceptively spacious villa is in the ideal setting for a relaxing holiday. Do as much or as little as you like. You could spend the whole day soaking up the sun around the heated pool, cook a meal on the barbeque or maybe laze in the hot tub until the sun starts to set. The large south facing patio is ideal for sunbathing. On the higher terrace, which is gated to enable small children to play safely, you will find a covered pergola which is perfect for alfresco dining. From here you can enjoy the magnificent view across the Bocayna Strait to Fuerteventura. This semi-detached self catering villa is just a short walk to the beach and resort amenities and is suitable for children. TV with some UK channels. Our rates for the villa rental vary throughout the year - please look at the availability and prices page or contact us for details. More pictures of the villa are available on the gallery page. For more information on the villa or to make a booking please contact us.